This ring was the width and height to complement my low profile engagement ring. The only problem was that the engraved message was different than what we specified but it turned out to be okay in the end. This classic palladium wedding band is perfect if he prefers a narrow ring. 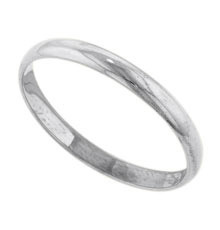 The band measures 2.5 mm wide and 1.1 mm high.